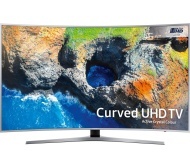 alaTest has collected and analyzed 172 reviews of Samsung UE55MU6500 Series. The average rating for this product is 4.7/5, compared to an average rating of 4.3/5 for other products in the same category for all reviews. We analyzed user and expert ratings, product age and more factors. Compared to other products in the same category the Samsung UE55MU6500 Series is awarded an overall alaScore™ of 89/100 = Very good quality. "A good telly very good value for money great picture very easy to set up and install yourself"
Fantastic discounted price plus a bonus credited to your account and a year interest free to pay at the cash price and it had free delivery as well. Simply a Super Deal and the TV picture and looks with the silver frame are superb. Highly Recommended. I bought this tv a week ago and I love it! Great picture very easy to use too.